Solidoodle is a 3D printer company out of Brooklyn, NY. 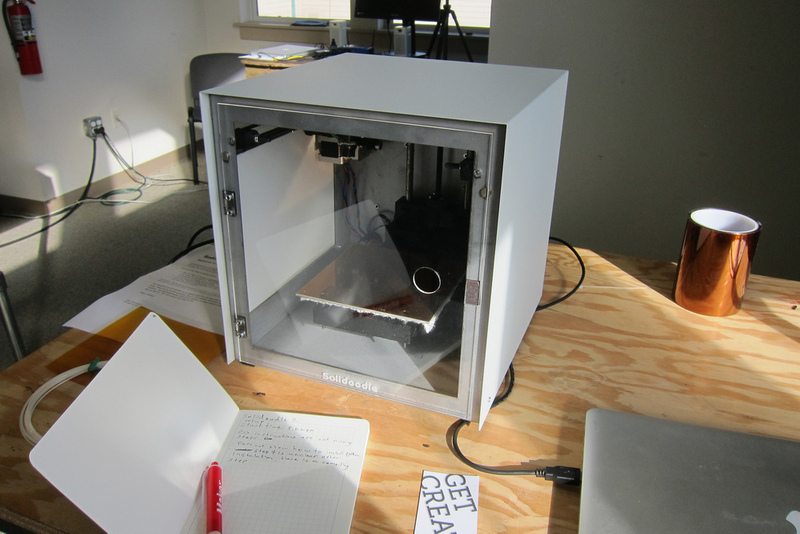 Their goal is to produce quality desktop 3D printers at an affordable price. At $500-800, they are not the least expensive but they are certainly competitive. Some reviews of the Solidoodle 2 have given it fair ratings: Difficult to set up but makes consistently good prints. It can print with either PLA or ABS filament. The difficulty in setting up and troubleshooting the Solidoodle is somewhat compensated by their good Help resources which can help someone with little knowledge navigate more effectively the early stages of set up. The Solidoodle Pro has a heated build platform and the Solidoodle 2 Expert has an optional cover and clear door. Both the heated platform and environment are necessary for the ABS to successfully print. Many desktop ABS printers don't have a pre-made box as part of their unit. Many people find a cardboard box to work as effectively but the clear door obviously works better to keep an eye on your print. The newest version (as of October 2013) has a larger build platform- a whopping 8" x 8" x 8"- one of the larger desktop printer capacities. Sam Cervantes founded Solidoodle in 2011. Prior to this he was Chief Operations Officer at another New York-based 3D printing company. He has also worked as an engineer for the aerospace industry in India and China.